Sol. 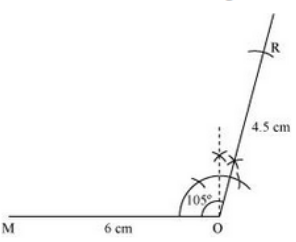 Step 1: Draw a line segment MO of length 6 cm and an angle 105° at point O. Now, keep O as centre and cut an arc OR of 4.5 cm from this ray. 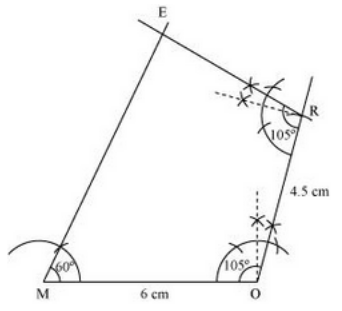 Step 2: Draw an angle of 105° at point R.
Step 3: Now, draw an angle of 60° at point M such that it intersects the ray drawn in previous step at point E. Complete the quadrilateral MORE. Sol. We know that sum of angles of a quadrilateral is 360ᵒ. 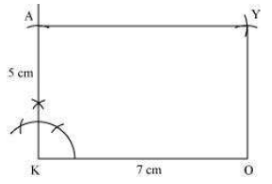 Step 1: Draw line segment PL of length 4 cm. 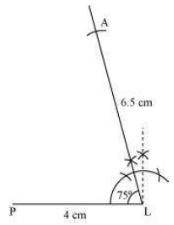 Now, draw an angle of 75ᵒ at point L; cut a line segment LA of 6.5 cm from point L.
Step 2: Draw an angle of 110ᵒ at point A. 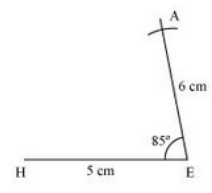 Step 3: From point P, draw an angle of 90ᵒ. 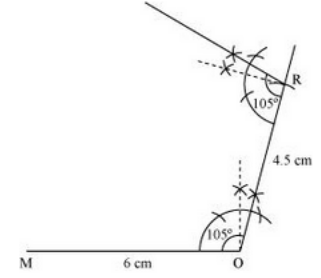 This ray will meet the ray from point A intersecting at point N.
Sol. 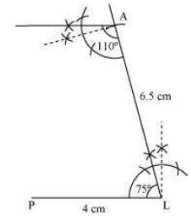 Step 1: Draw a line segment HE of length 5 cm and an angle of 85° at point E. Now, keep E as centre and cut an arc EA of 6 cm from this ray. 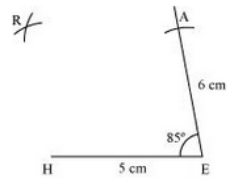 Step 2: Keep H as centre and draw an arc of radius 6 cm on the opposite side of point E. Draw another arc keeping A as centre of radius 5 cm, such that it intersects the previous drawn arc. 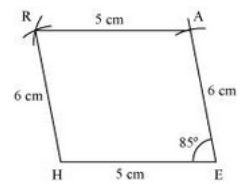 Let the point of intersection be R.
Step 3: To complete the quadrilateral HEAR, join H and A to R.
Sol. 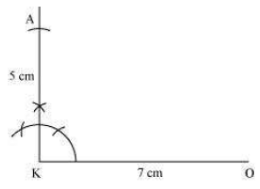 Step 1: Draw a line segment OK of length 7 cm and an angle of 90° at point K. Now, keep K as centre and cut an arc KA of 5 cm from this ray. 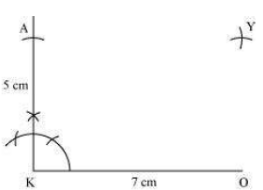 Step 2: Keep O as centre and draw an arc of radius 5 cm on the opposite side of point K. Draw another arc keeping centre as A of radius 7 cm, such that it intersects the previously drawn arc. 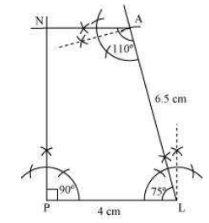 Let the point of intersection be Y. Step 3: To complete the rectangle OKAY, join A and O to Y.